African philosophy is philosophy produced by African people, philosophy which presents African worldviews, or philosophy that uses distinct African philosophical methods. 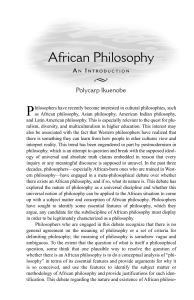 Although African philosophers may be found in the various academic fields of philosophy, such as metaphysics, epistemology, moral philosophy, and political philosophy, much of the modern African philosophy has been concerned with defining the ethnophilosophical parameters of African philosophy and identifying what differentiates it from other philosophical traditions. One of the implicit assumptions of ethnophilosophy is that a specific culture can have a philosophy that is not applicable and accessible to all peoples and cultures in the world, however this concept is disputed by traditional philosophers.Father of African Philosophy, Prof. Uzodinma Nwala,prior to his employment to teach at UNN, there was nothing called African Philosophy as course of study in any university. “All we were taught as students were Western philosophy. Nothing like African philosophy existed anywhere. 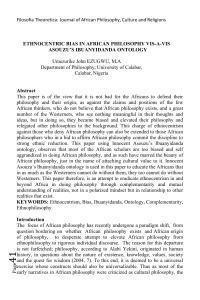 In fact, many years after the introduction of the courses, there still remained arguments among experts, whether there was really African Philosophy"".He was awarded the Aime Cesiare award in 2013 at the University of Abuja.African Philosophy can be formally defined as a critical thinking by Africans on their experiences of reality. Nigerian born Philosopher K.C. Anyanwu defined African philosophy as ""that which concerns itself with the way in which African people of the past and present make sense of their destiny and of the world in which they live."" In this regard, African philosophy is a critical reflection on African leaderships in the administration of their duties towards their citizens; the morally blameworthiness or praiseworthiness of it. It will also provide possible solutions to the problems experienced in African governances.As a rational critical inquiry on Africans and their worlds, it is consequently the task of African philosophy and of African philosophers to make the uncoordinated coordinated, the uncritical critical and the inarticulate articulate, particularly of the preliterate Africa.One of the most basic disagreements concerns what exactly the term ‘African’ qualifies: the content of the philosophy and the distinctive methods employed, or the identities of the philosophers. On the former view, philosophy counts as African if it involves African themes such as perceptions of time, personhood, space and other subjects, or uses methods that are defined as distinctively African. In the latter view, African philosophy is any philosophy produced by Africans or by people of African descent, and others engaged in critiques or analysis of their works.Nigerian philosopher Joseph I. Omoregbe broadly defines a philosopher as one who attempts to understand the world's phenomena, the purpose of human existence, the nature of the world, and the place of human beings in that world. This form of natural philosophy is identifiable in Africa even before individual African philosophers can be distinguished in the sources.